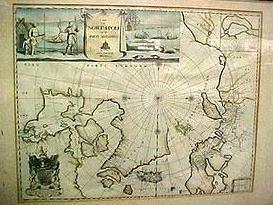 Map of North Pole Circa 1680: This beautiful Map is hand colored and printed in 1680. It's illustrations are bright and fascinating to behold. Showing both Eskimos and walrus the engraving is beautiful. Description: This beautiful Map is hand colored and printed in 1680. It's illustrations are bright and fascinating to behold. Showing both Eskimos and walrus the engraving is beautiful.